Dearies. I'm still around. Just not as active. I'm still reading your blogs, just not commenting. I did not report to work for almost two weeks. Sherman was admitted to the hospital on 16th May (Monday evening), and discharged on 21st May (Saturday) morning. We thought the nightmare was already over and we could go back to our daily routine, BUT fever came back on 23rd May! We took Sherman to the famous doctor located at Jalan Ipoh, and asked for her second opinion. Apparently, it wasn't Kawasaki recurrence, just infection because his immune system was already weak and all. Took antibiotics for 3 days, and fever gone. Thank God. Babies are not the same as adults. You GOTTA be there 24 hours a day. You can't say "Ok, we are going to work now, we will come see you after work, k". For the past two weeks, me and hubby rotated like a robot. Morning, I sent Kz & G to school, then went to the hospital for Sherman. Hubby took his shower in the hospital, and went to work for a while to settle his things. He came back to the hospital around 4pm, and I went to pickup Kz & G from school and sent them home. Next morning, same routine. Hubby slept in the hospital one week already. Things are pretty back to normal this week. But the phobia is still there. Kawasaki fever is something we can't control, can't prevent. It just happens (wtf when the doctor said this, but yes, it just happens - feeling MEH). Your baby is so cute lah! I love his smiles. Get well soon Sherman. Your toes looked like eagle's claws to me. Can catch anyone up with one grab! You probably can control people too. Usually our fingers when closed tightly got lubang in between would mean money cannot hold long. I don't think it is the same for toes. If you are a Buddhist, I would strongly advise you to pray at the Tien Ho Temple near Taman Seputeh. Beg the 3 Goddesses there to help baby to recover fast. Hey Mummy Princess, you must update us with baby's good recovery. Uncle TM worries easily and prays for his full recovery. Louiz, good to hear from you! 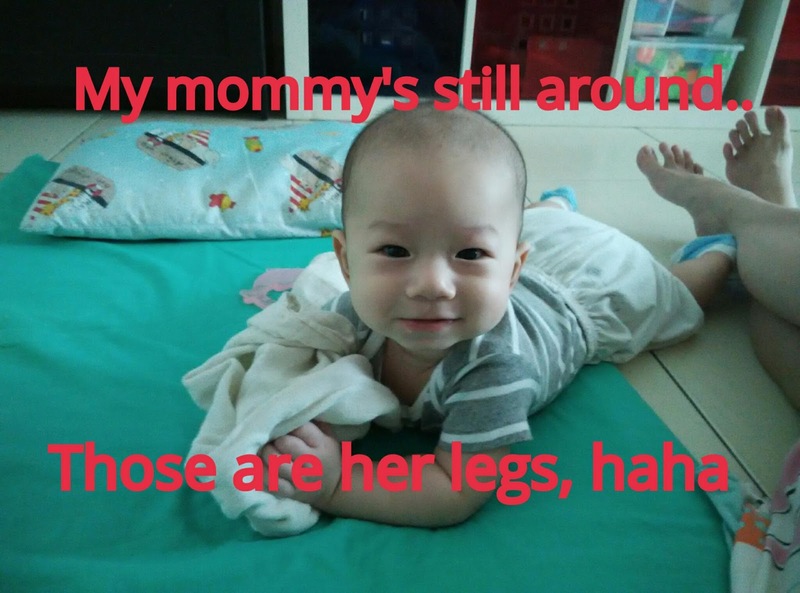 But only see your kaki hah..hah... Baby Sherman is so cute lah. Makes me happy to see his cute and smiley face. Take care my dear! Same here, busy busy busy! Glad that your kids are doing ok now. You also take good care ar! Glad he is recovering. It is heartache seeing your little one sick and you could not do anything. Super love the last photo. He is so cute. Baby Sherman looks so adorable! Please take good care of yourself too! Glad to know that all well ends well.. Take Care.. you and your little family! It must be really a nightmare for you guys. As a parent, I do understand how you feel. Glad all is over now! Thanks for continuing to patronise our blogs. Phew.. thank God Sherman is fine! Yes babies are like that, you have to monitor them non-stop. Theyre like our lives! huhu i get so emo reading about babies etc. Get really really healthy soon Sherman so mommy and daddy can rest. Wow! Kawasaki sounds really serious. Good to hear that Sherman is getting better dy. Take care! yea, tedious to be parents. Yet we need to do it well. Take care..